ST. AUGUSTINE BEACH, Fla. –– Jeff and Lori Hooks lived the life of a military family for 30 years, moving from base to base. During that time, St. Augustine Beach served as more of a hometown for them than most other places. “When we vacationed, we would vacation in St. Augustine. So, our kids knew it as kind of a summer home,” Lori said. With Jeff’s Marine Corps career now behind him, the couple will finally claim the beach community as their own. 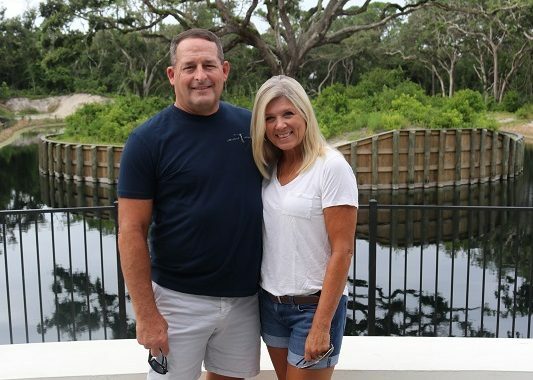 Jeff and Lori will be among the first residents to move into Ocean Ridge, located on Anastasia Island at Mickler Road and 11th Street. Developed by McGarvey Residential Communities, Ocean Ridge will offer Florida beach style architecture with lake views and private swim club. In early 2019 the Hooks will move into their new semi-custom home, built by SH Design. Ocean Ridge builders, Riverside Homes and SH Design, both offer expansive floor plans, spacious master suites, gourmet kitchens and covered patios starting at 2,250 square feet. Model homes are currently under construction. The couple already rents nearby, which means they’re getting to know their new neighbors a little early. The pace of life will likely be a lot calmer than the family knew when Jeff was in the Marines. Jeff and Lori first met as students while attending Valdosta State University. It was a fairy tale kind of romance—Jeff played football and Lori was a cheerleader. The two married, Jeff joined the Marines and deployed six months later. The couple would go on to raise three children. With the military lifestyle came lots of moves and, long-distance communication. In the early days during Jeff’s deployments, the family stayed in touch using snail mail–which could take two weeks to arrive. Then, phone calls (which, they quickly learned, were expensive) and later, email. That progressed to satellite phones and finally, daily talks on Mac Books. Jeff deployed 14 times between 1987 and 2017, serving in Desert Shield, Desert Storm, Bosnia, Iraq and Afghanistan. His official duty was working as a ground logistician. While on the job Jeff served under leaders, who would eventually rise in their careers, like Secretary of Defense James Mattis, White House Chief of Staff John Kelly, and Gen. Joe Dunford, chairman of the Joint Chiefs of Staff. Even more rewarding, Jeff said, was serving with countless young Marines who had volunteered to do something bigger than themselves. “They were selfless, driven and committed. It was an honor to lead those men and women,” Jeff said. Today with Jeff’s retirement, there’s a little less urgency in their lives. The couple’s three children are grown and Lori, who is an elementary school teacher, will teach in the fall. Before choosing Ocean Ridge, they looked at homes up and down the coast. They really liked Ocean Ridge because it was so close to the beach and it was a new construction, rather than an older home they would have to personalize or rehab in some way. Today, Jeff continues to work as a logistician. This time, as director of Global Logistics for defense contractor Raytheon. It’s like the work he did before, just earlier in the production cycle. Jeff admits working in a revenue-driven world has proved a bit of a transition. “It takes a different type of leadership and influencing. In the Marines, I could tell a person to go do something, and there wouldn’t be any more discussion,” Jeff said with a laugh. What hasn’t changed, though, is the passion to work with patriotic people with a mission to serve the country. Semper Fi and welcome Jeff and Lori.